How does one begin to speak of Rioja, Spain? Does one begin at the beginning, with wine production conservatively estimated at 2000 years old? Does one begin with the first recorded wine production in the 8th century? Or the earliest recognition that these wines were unique in 1102? Where does one begin? 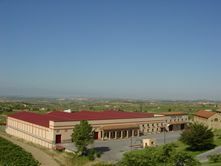 In 1894, the Bodegas Palacio was built in Rioja Alavesa, Spain. It was the hub for a newly formed winery that surrounded it on 170 acres; a winery that was formed around the concept that all wines needed to express their own "signature" or personality. It is a concept embraced by quality craftsmen the world over. Now, the winery is no longer owned by the original family, but seems to be guided by the original dedication to quality over quantity. Rioja has gone through much change in the relatively short period of recent time.... since the 1980's, the entire world of wine has changed and Rioja has changed right alongside it. Outdated fermentation and maturation methods have been discarded, or rather - invigorated with new technology. Of course, one hopes that the new technology will never blind people to age-old techniques that have worked for centuries and always will work in the right hands.One hopes, that the vision of Don Cosme Palacio y Bermejillo (the founder of the Glorioso line in 1928) will continue to hold firm: to allow wines to express their signature or personality. Good wine is everywhere, if one knows where to look. Thank you for letting me look for you, and hopefully find a few deals out there. This isn't the best wine I've ever had, or even the best under $20, but I am impressed with it.... because as the Burghound would say "It is the duty of all wine to express terroir". This wine, I believe, accomplishes that and is a nice way to become acquainted with Rioja.